Happy Monday! Today I want to show you a little poofing that I've been up to. The vignette below just came together by accident in the last few days and there's a story with it. Awhile back The Nester did the post about looking around for bare spots that need to be beautified...stay with me here...I have thought about that post several times. Then last week I was Christmas shopping at this adorable shop here in Edmond called Sterling's. I bought that clock that you see there on the wall for someone else. Yes it's true...I know you do it too. I decided it had to hang on that bare spot above my table. Perfect! See the cute red reproduction bucket? I don't know what it's called but I saw it the same day and it was part of a set of 3. The set was $99.00 and I had no use for all of them. I kept thinking about the red one though...so I called the man and asked to buy just the red one. He said yes! $25.00. Woo hoo! I'm so proud because I never ask questions like that. Right now there's a fabulous fake plant in the red bucket but I'm picturing geraniums or a fern when the weather is nicer. I'm happy with this spot now and it's the perfect view when looking into the living room from the kitchen. ~WOW! Your question really paid off! Your corner all came together very nicely....love the clock and the bucket. I've gotten much better at asking questions myself lately, and it's paid off in spades! I guess you won't know if you don't ask! Good for you and I love that pretty space - you did good! I love that bucket - A.Lot. What a great find. I've found in the last year that people are willing to deal much more than before. During this economy, it's either sell it or sit on it! Love that clock! I think your bucket is what they call a fire bucket...I don't know if it is an original or reproduction, but they were the buckets on the firetrucks before they had hoses. I think!!! It is just perfect. Now, I'm impressed with you asking 'the question'!! Good going. I got a real kick out of your title. CUTE! OK sweet friend...I think all of your new goodies need to be wrapped up and sent to my house...hehe!!! I love your new vignette...you poofed it perfectly!!! I am not sure what I love more...the clock or the bucket...I love my red but that clock is beautiful...oh no...I can't decide!!! I may need to come to Edmond and do some shopping:)!!! Looks cute! I have lots of corners that I need to get with it and beautify. I love the vintage look of your corner! Fun how all the pieces came together. I would say your corner vignette is perfect. Aren't you glad you asked if you could only buy the one? It never hurts to ask, the worst they can say is no. You go girl. OOO, Stacey girl...that red bucket is soooo cute. I love it and I love the faux plant in it, too. Now, that clock was MEANT for this very spot...no doubt about it. Go find something else for that person!! And, you are right...I've done it myself..a lot..
what's worse, tho...I just bought the cutest plaque for my DAUGHTER for Christmas and now I WANT IT..No, no Nanette...I won't keep it but I sure do like it..she, however, will LOVE it.. The bucket is wonderful! I love your big clock, too! I like your poofing abilities! Love what you did, and you brave girl, you......good going! It's so lovely, Stacey! Look at you, being all bold and all and look what it got you! I love the clock and love the red bucket! You've poofed beautifully! So glad you discovered me so that I could discover you. 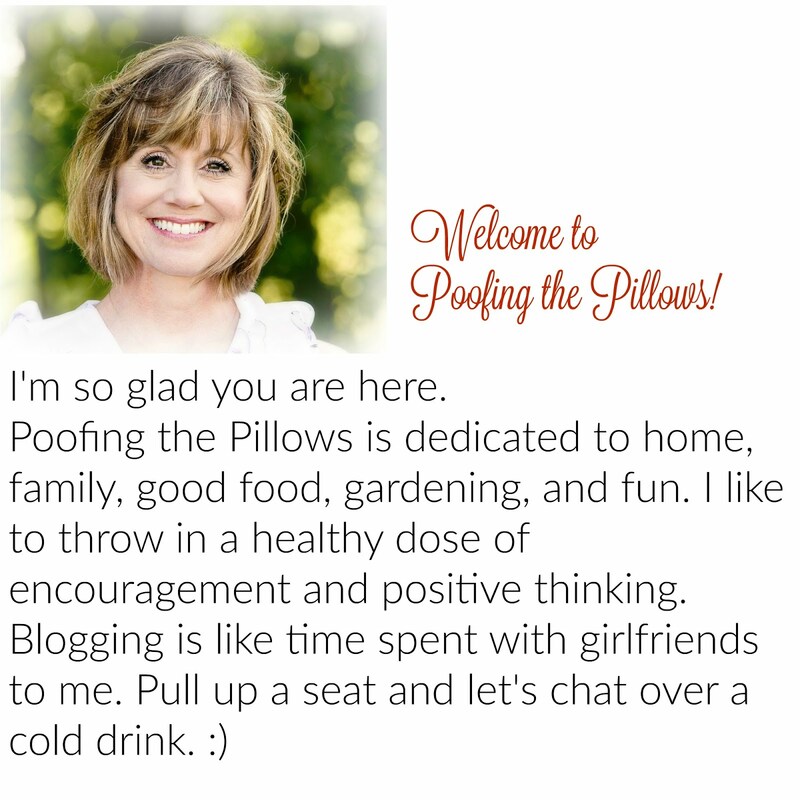 Your blog is delightful. Thanks for stopping by the Open House. I hope you will visit often ~ I know I will be returning to your site soon and often. Happy Thanksgiving! LOVE the clock and the red bucket! What a lovely re-do for your corner. you did a great job! I love the cache pot for the fake-and eventually real plant! lol I use fakes too sometimes...lol that is a great bucket! Great job Stacey. The whole corner looks great. I absolutely love the little red bucket and your lamp too! It does pay to ask. Our attic does run the whole length of the house. I'm not sure how far that is though, I'm guessing about 40 feet. I can barely walk under the lightbulbs that screw into the ceiling though. I'd love to put some dormers in so it would get some natural light. Maybe someday! That clock and the bucket are just gorgeous!! I am going to have to go to that store next time my friend and I are in town!!!! LOVE your poofed corner!! Wow, Stacey, it looks adorable. I love the clock!!!!! My husband and I are clock nuts. Have a wonderful Thanksgiving. Many blessings. Stacey! You did a great job on that corner! I love the bucket. It's so cute. And the clock makes it all come together. Very charming. I love the letters on the bucket. Yeah, I've done that, bought something for a friend that I ended up keeping, but of course we always buy things we find appealing right? Your vignette looks great and I really love the red bucket! Just gorgeous! Love that bucket! great bucket, i would of wanted it too..
Love the lamp, pot and clock! all quite charming. I like that idea.. I will start looking around my home for bare spots.